Telecom Wholesale is continuing to look overseas for key executives as it prepares for operational separation later this year. While the exact terms of that separation have yet to be confirmed, the wholesale division is boosting its executive ranks with people who have experience of similar separation efforts in the UK and who can bring what it calls “commercial sharpness” to the new wholesale organisation. 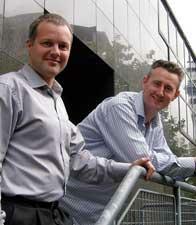 The latest recruit is Paul Hayes, who recently arrived in New Zealand to lead product management. Another British recruit is David Ellis, head of wholesale strategy. Telecom’s general manager of wholesale, Matt Crockett, has been keen on bringing a blend of experience into the organisation and certain skills and capabilities, says Ellis. That could loosely be described as “commercial sharpness”, but more specifically it’s about customer focus. It’s also about establishing trust where precious little exists at the moment. “The major difference is customers are still concerned there’s a level playing field,” says Ellis. “In the UK this is taken as a given. We are at pains to ensure we treat all customers the same way, but that’s not yet transparent. In that regard, Telecom wholesale is playing catch-up. And with so much happening at once, it won’t be easy to maintain service, let alone improve it. Ellis says Telecom is trying to do what BT did in the UK in half the time. Hayes says BT’s responsiveness has improved greatly over the last few years, but it takes time to develop and the process started well before it was apparent to customers. Another difference is that BT was separated in two different phases whereas Telecom will move straight to a three-way split. Ellis says the separation is difficult in itself, but compounded by plans to invest in next generation telecoms technology, number portability and other pressing issues. Telecom also doesn’t have the resources of a BT. The British example will at the very least provide some lessons and help Telecom avoid some pitfalls, Ellis says. Telecom is aware of certain areas of difficulty and hopefully will be able to ensure costs don’t impact on customers to the same degree they did in the UK. For Hayes the focus will be on products. These include ensuring delivery of ADSL2+, Ethernet fibre services, enhanced bitstream and high-speed network services as well as local loop unbundling. “Ethernet is a very strong portfolio in the UK so we want to get it out the door before September,” he says. The product roadmap will be updated by the end of March and from then on will be tightly married to a consultation calendar, he says. Ellis says that consultation won’t slow development down. “To be honest with you, why wouldn’t you do that?” he asks. “It makes the process better,” adds Hayes. There are also tantalising new business opportunities in providing business support systems such as billing services. As a separate business, Telecom wholesale will also be freed to partner with systems integrators and other telcos to provide the connectivity component in larger outsourcing deals, rather than being seen as a competitor by virtue of the unit’s connection with Gen-i. “One of the interesting impacts of separation is that formal separation makes it clear that people can do business with us and trust there is no back channel to retail,” Ellis says. However, while Telecom wholesale is thinking about the future and new products, for now the focus will be on providing “scaled, repeatable, network-based services — that’s our bread and butter and we need to get it right,” says Ellis. The immediate drive will be about mitigating the impact of separation on customers. Ellis says one study has shown service levels at BT’s Openreach unit, which manages the “last mile” of network between the customer and the exchange, are lower than before the split. “It’s not too surprising that’s a consequence of upheaval. All systems have to be recut to meet separation,” he says.